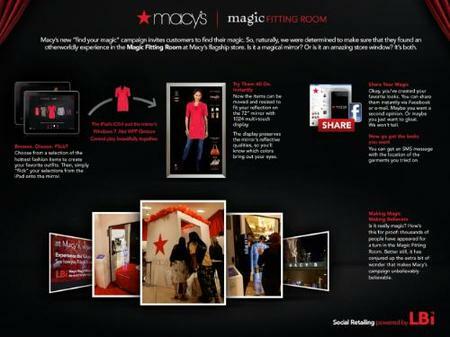 American department store Macy’s have introduced Augmented Reality into their changing rooms with touch sensitive “magic mirrors”. Obviously you’re not going to get the right fit from a computer-simulated image… but you will get a gist of what a piece of clothing would look like on and whether it’s worth hunting the piece out in the shop and trying it on properly . If you fancy *sharing* the images or just saving them for reference then you can send images of the whole experience to your Facebook page, cell phone or email. . It was made in conjunction with marketing agency LBi. “As the role of retail changes and the lines between physical and digital continue to blur, agencies are tasked with providing innovative solutions that help marketers enhance the customer experience,” said Christopher Enright, Chief Innovation Officer of LBi. The Google TV Box – Is It Too Geeky for the Masses?